Aaron Larget-Caplan's playing catches every nuance of the music. In 2006 I released my debut album, Tracing a wheel on water, on which I recorded an Afro-Cuban lullaby arranged by Leo Brouwer (Cancion de cuna). 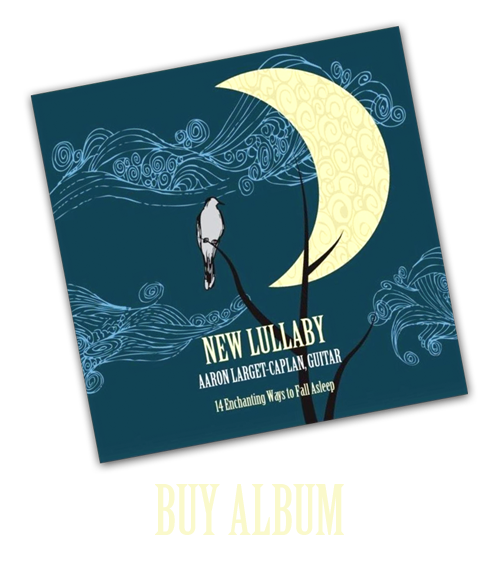 Whether hearing it in a live concert or from the Tracing CD, people always spoke about how the lullaby "got 'em", even though there was much more 'difficult' music being played. I asked myself why this simple piece of music could grab so much attention? The other works were also highly praised, but none got as much public reaction as the lullaby. Was it the simplicity or beauty of that particular melody or did people just need a rest? Many people suggested an album of lullabies with a focus on famous ones arranged for guitar, but that had been done and the idea did not intrigue me. Around this time, I played an arrangement of George Gershwin's Summertime by Toru Takemitsu and my questions were answered: Bring the two worlds together! Being passionate for contemporary music, I began asking living composers to write brief new compositions for solo guitar in the genre of a lullaby. And with that, the New Lullaby Project created, and the next day I practiced. There are two basic types of lullabies: one gives the listeners warmth and protection, while the second tends to be darker with hints of fear. The former calls for good dreams to the wary soul, and lets him know that he will awake safely in a better tomorrow. The latter lives on the idea that night and even sleep can be dangerous. Maybe this comes from the folk tradition of tempering our demons by singing to them, voicing our fears that are greater than our worldly matters, or the simple truth that one can catch a cold if one's feet are not fully covered while sleeping. Who's afraid of a Lullaby? !